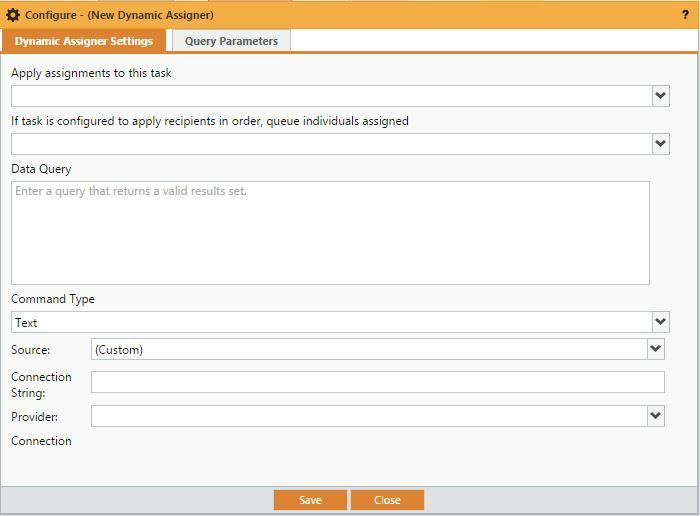 The Dynamic Assigner plugin allows the use of SQL and collected form data (or other request specific information) to define task recipients. To configure the Dynamic Assigner plugin select it from the Task options and drag it to your process canvas. Apply Assignments To This Task: This is the task to which you want to assign recipients. Only tasks included in your process will be shown. Command Type: Defines whether a text-based query or stored procedure. If task is configured to apply recipients in order, queue individuals assigned: Yes/No. If Yes is selected (and the process rule is "For All Recipients in Order") the process will retrieve, retain and enforce the order and processing information at the time that this request first fires. If No is chosen, or no selection is made, the system will default to No. Source: Select the pre-defined data source that the query or stored procedure will run against. If no source is selected the system will default to the Integrify Database. As stated above, another option available with the Dynamic Assigner task is the ability call a stored procedure to return assignment data. Command Type: Select stored procedure from the select list. Note: The Dynamic Assigner does not accept OUT parameters from a stored procedure - data must be returned via the procedure itself. Map each parameter to the source of the data within the request and click "Close" on the Configure screen when complete. Oracle Users Only: Take care on order of the parameters. Due to an Oracle Provider constraint they must be created in the exact same order in the Query Parameters screen. Our training example is a New Employee On-boarding Process. In this process the employee will fill in an initial New Employee Information form. 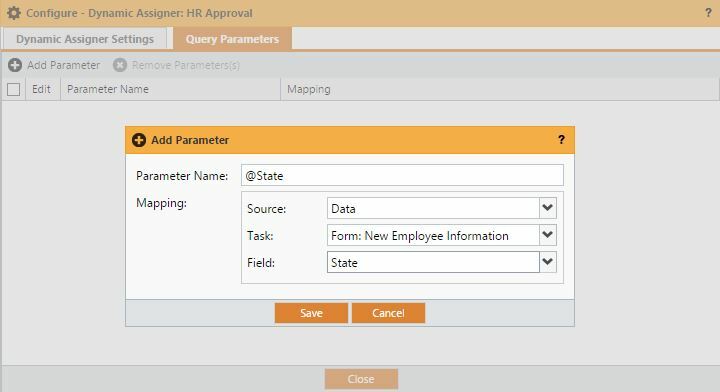 After the completion of this form, the Dynamic Assigner plugin will execute and use data provided by the New Employee to assign the appropriate HR representative for initial approval. In this example we will assume that the HR organization is large and experiences high turnover. For those reasons, the use of traditional recipient assignments would lead to a complex set of rules and require constant maintenance and review. Instead, the Dynamic Assigner Plugin will use the State value provided in the form, perform a query against a cross-reference table and the Contact table, and assign the appropriate HR Group to approve the form for the New Employee. Note: The SQL statement must pull a distinct Contact_ID element from the Integrify Contact table for the Dynamic Assigner to execute properly. If you use a custom table to do your own user-permission tracking, be sure that your query returns that integer field "AS Contact_ID". The connection between the data collected in the form and the data query above is the query parameter of @State. 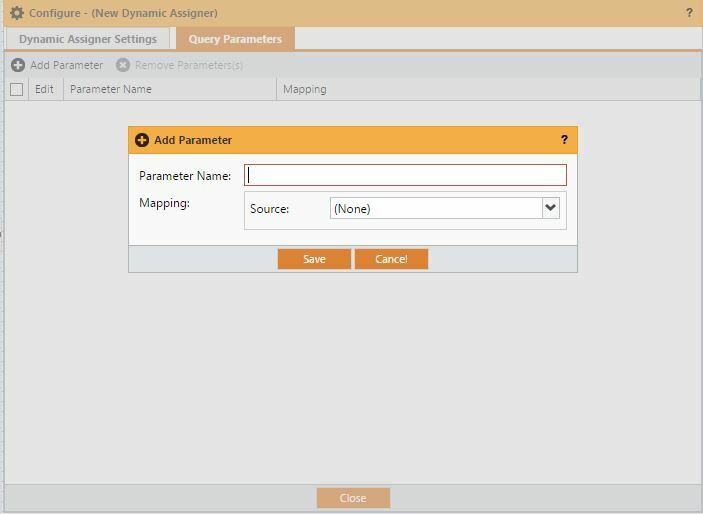 To complete the mapping you must also set the Query Parameter tab settings. In this instance the source is Data from a form, the Task Containing that form and the specific field are then mapped. Multiple parameters, or the use of the same parameter multiple times, is permitted. Note: This tab will only display after you have saved the initial configuration. Click Save, then Close on the Configure Screen to save these mappings and complete your configuration. 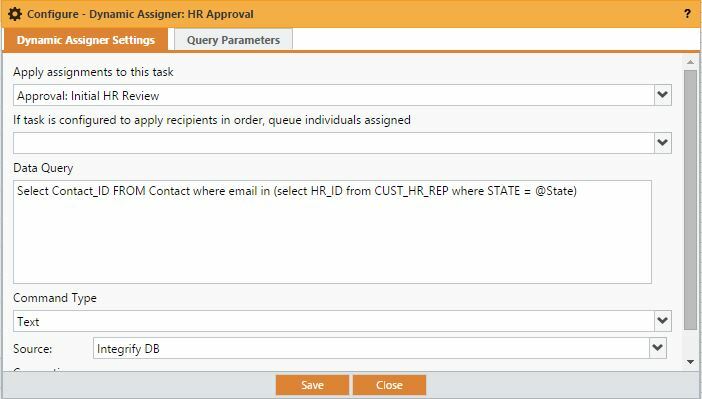 When the New Employee submits their initial form the Dynamic Assigner plugin will check our custom table, select the name of the HR Representative assigned to that State and assign the HR Review task to that contact from the Integrify system. Below you will see the Task History of our training example showing the Task assigned as well as the User to be assigned per the Dynamic Assigner plugin.